just purchased my first pellet grill the 640. Looked and researched for a long time. Back and forth between the camp chef woodwind (searing cap. )the rec tec 700 ( controller, warranty, cust. service) and the yoder 640. Went with the 640 - searing capability, build quality, and MADE IN USA) cost more but i think i made the right decision - now for the wait!!!! 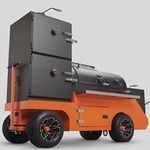 glad to hear that - never ran a pellet smoker - only charcoal.